Addition, division, multiplication and subtraction. These are the four mathematical operations. If you are not good in these operations. You are not good in calculation. If you are not good in calculation. You cannot solve simple mathematical problem. Due to this problem you have tension. Due to this tension you go to tuition. But now a day’s tuition is a fashion. So my dear student doesn’t go to tuition. Take help from your teacher and, follow her instruction. 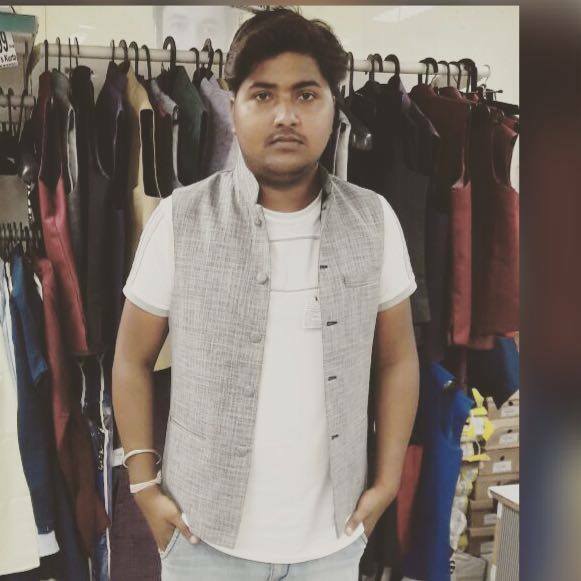 Vikram Modi (Batch 2012-13) studied at The Fabindia School. For his further studies he went to Ahmedabad. 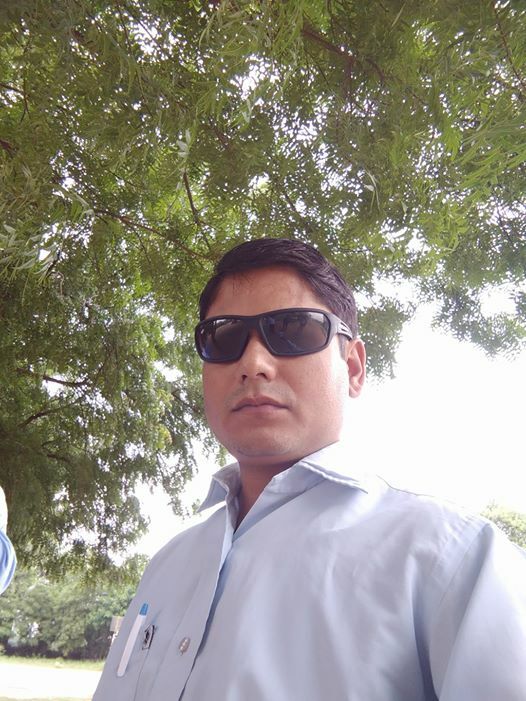 There he did M. Phrama from the Tantia University, Sri Ganganagar. Nowadays he is the CEO at the Sun Pharma Company. The message that he would like to give is that having small dreams and being afraid to fail is the antithesis of this advice, and it’s something many of us do, even though we may not want to admit it. The two go hand in hand, if you are too afraid of failing you’ll keep your dreams on a leash. But if you overcome that fear, and jump out there fully willing to completely fail, you free your mind to dream up new adventures and goals for your life. Failure comes with trying, and a life of not trying will not leave you satisfied, so it’s good to continually put yourself out there. Monday, 4th December: Staff had PDP Session on that day. Mr. Ajay Vijaywargi read out a thought ‘Compassion is Action’ from the book “Can We Teach a Zebra Some Algebra “by Debashis Chatterjee”. 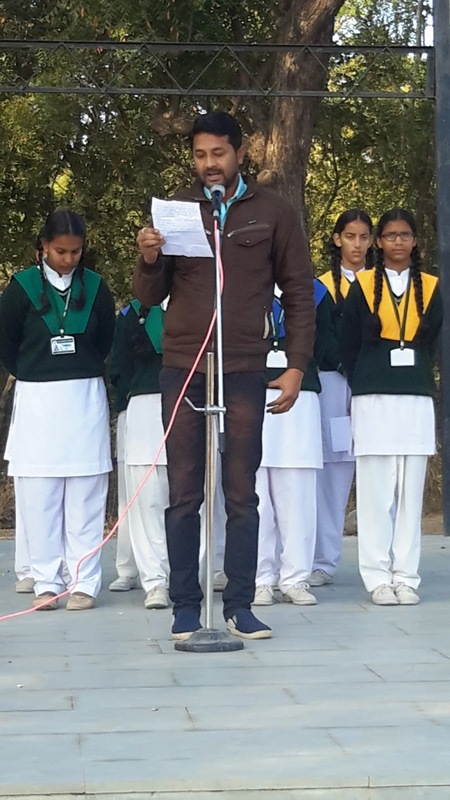 Mr. Krishen Gopal read out a thought "आपको हर दिन सोचना होगा कि अपने शिक्षण और सेवा को कैसे बेहतर बनाया जा सकता है ।" from the book "आइसक्रीम मेकर" by सुबीर चौधरी I Staff then discussed their opinions, gave their views and uploaded a writ up with graphics and photo in Alchemy of Learning. Staff wished Vimmy Rajpurohit a Happy Birthday. May God bless her and best wishes for her future. Mrs Aysha Tak/ Educator was selected as Teacher this Week for her compassion and sincerity towards the students. She spoke few motivational words to the students. She said that there is no age bar to do any work. Nothing is impossible. If you make up your mind you can do any impossible thing at a small age also. She related a story to explain this fact to the students. In that story there were two boys one was of 10 years old and other was 6 years old.They both were best friends, one day they went in the jungle and suddenly 10 years old boy slipped in the well and then the 6 year old boy threw a bucket in the well and helped that boy to come out from the well. Because of his hard-work the boy came out and when the boys told the incident to their parents and villagers they did not believe them.Then the villagers and parents went to Rahim chacha and told him the story. Rahim said that it is a true story because he said in the forest there was no one to help, that's why the boys made impossible thing to possible by their hard work. ATK: I joined the school on 21st February 2009. ATK: The Principal at that time was Parineeta Ranpal. ATK: The environment was eco-friendly and good. ATK: I taught Pre- Primary Classes. ED: Have you taught any school before Fabindia? ATK: Yes, I have taught in Vivek and Noble School before Fabindia. ATK: Students should work hard to achieve their goal. Because they gives us food. Tuesday, 5th December: Pre Boards I for Class X started. In rest of the classes revision work is going on for UT III which is going to start in the commencing week. Friday, 8th December: The School is participating in the Inter School Debate Competition which is going to be organised by KSLP School, Falna on 20th December. The topic for the debate is 'No War, No Peace.' Our participants had a Skype Session with Mr. Vikram Sihag who is training them for the debate. He is giving them tips on how to give their best performance, how to rebut and also content for and against the motion. A very big thanks to Mr. Vikram for offering his support giving his precious time from his tight schedule. 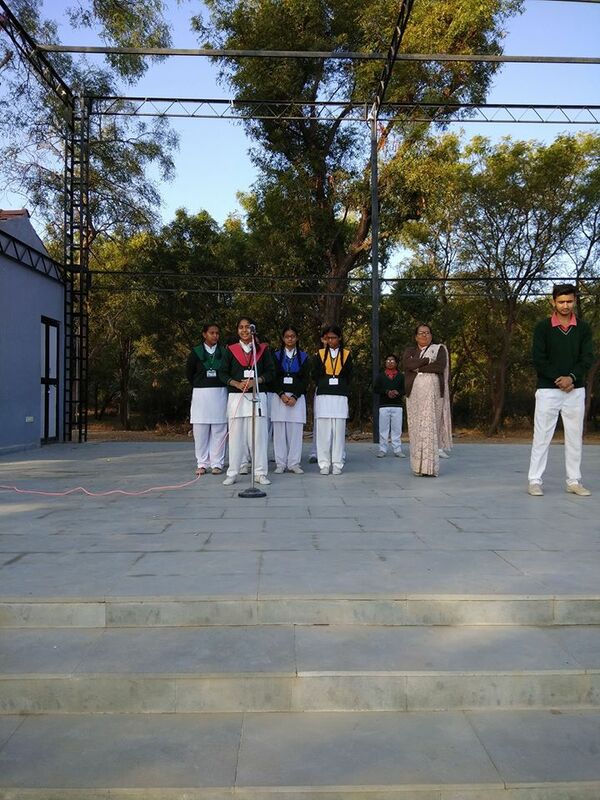 Saturday, 9th December: Bhumika Nagar/ XII was selected as the Student This Week for her best performance in Sports in the year round. She addressed the Assembly. 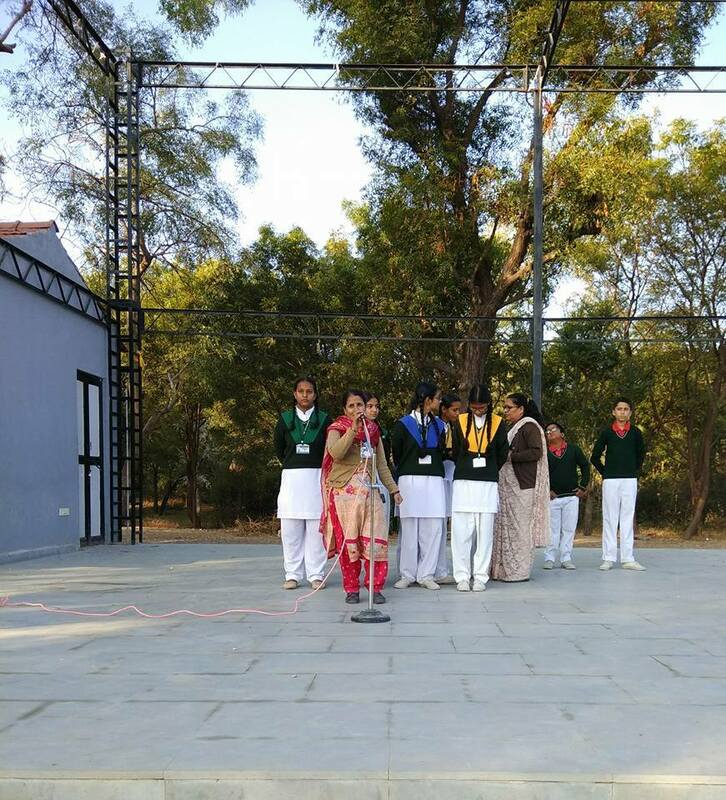 She told the students that 'Practice makes a man perfect' not only in Sports but also Academics. If you need to achieve your goal you need to practice a lot. Mr.Usman Gani gave a speech on the occasion of World Computer Literacy Day. He explained the students the importance of technology in present world. 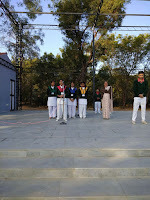 The School observed an Activity Day. They had Reading Project, GK Classes, Club and Society Meeting and Sports activity. Students enjoyed the day.